Easy-peasy fruits and veg for your weeknight dinner table. Balsamic vinegar adds a delicious bite and brightens the color of fresh strawberries. Wash, drain, and gently shread a favorite crispy lettuce, spinach, or other fresh green into a large bowl. Head and slice fresh strawberries and toss with shredded greens. In a small dish, whisk oil and vinegar until emulsified. 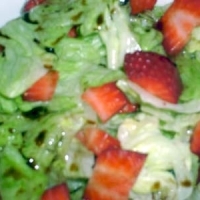 Just before serving, drizzle a light amount of balsamic dressing over the salad. Like mysterix's recipes? Never miss an upload!